Trivandrum Rising - Our city tomorrow and how we can help it develop. : Another Bid for Vizhinjam + Mad Ideas Prosper! In the last couple of weeks, there has been a frenzy of activity in Trivandrum over a handful of infrastructure projects that could theoretically add up to over Rs 1,30,000 Crores of investment. Ordinarily, this would be mind-blowing news for a State whose cumulative infrastructure investment in the past 62 years may be less than this figure.Unfortunately, except for one notable exception, the enthusiastic activity has been for the benefit of fantasy projects whose probable outcome will be at best, intense embarrassment, and at worst, a State bankruptcy! The notable exception is of course the Rs 8000 Crore Vizhinjam deep water port project which received a viable operations after the financial bid submitted by the Leighton Welspun consortium was finally opened by VISL on February 6th after months of procrastination. Leighton has promised to invest Rs 1100 Crores in the superstructure of the port (terminal equipment such as super post panamax quay and gantry cranes) in return for an operating grant of Rs 480 Crores over the first 16 years of their 30 year operations period. Considering the pessimistic market study supplied by the project consultants to the bidders, it's a miracle that the consortium didn't ask for much, much more. A previous article on this blog had detailed the ways in which the consultants either grossly underestimated or missed out major potential revenue streams or worded their evaluation to make the project seem as unattractive as possible. A neutral observer may be forgiven for wondering whether the multi-Crore fee paid to these project consultants was to promote the project or deep-six it. And that too when white elephants are running amok across Kerala, fueled by flights of fancy packaged as "feasibility studies"! One would expect that the Government would quickly call Leighton Welspun for discussions in order to see whether a better offer can be received, which is a standard response in the case of single bids such as this. After all this is Kerala's single most important infrastructure projects (proponents of bullet trains kindly excuse!) and we have been waiting with bated breath for the past two years just for this moment. Here's one of the world's leading construction and infrastructure firms (one of only two firms in the top qualification bracket for NHAI contracts) bidding for the right to operate the project with the Government on the verge of raising and investing Rs 3040 Crores drawn from bonds, banks, financial institutions and its own budget into the port's basic infrastructure. However, a week after the bid was opened no such discussion has yet transpired and one now hears ominous suggestions that the bid may be cancelled because of the grant that the bidder has asked for. This is the same Government which just handed out a Rs 300 Crore contract without a tender just one week previously. 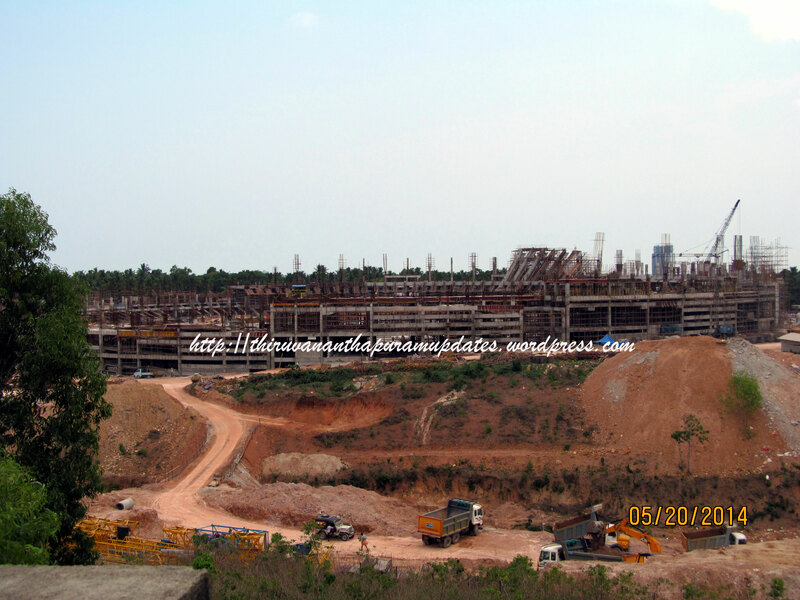 That persistent suspicion that Vizhinjam seems to lie in a neighboring State or country as far as the current occupants of North Block in the Secretariat are concerned continues to build. Apparently, there is some prevailing wisdom doing the rounds in the Secretariat that operators will come running in droves AFTER everything is built. Now, you may wonder whether our Government is balking because it wants to play it safe and be financially conservative. Au contraire, the gentlemen that we elected to run our State are going from strength to strength in approving wild proposals in record time. To start with, they approved the "pod car" project in Trivandrum in just about one week flat (wow, that's quick thinking! ), despite trifling issues such as the fact that it has about 5% of the capacity of the competing monorail system but costs about 50% as much and has only been deployed thus far at Heathrow Airport to shuttle passengers between the parking lots and one of the terminals! Now this latest creation of INKEL threatens to disrupt the monorail project by muscling in on its route from East Fort to LMS. One only hopes that saner heads will prevail upon the powers-that-be and instead deploy this technology as an intra-campus mobility tool for the sprawling 330 acre campus of Technopark which will soon be abuzz with 60,000 techies. But the cute little pod-car pales in insignificance when compared to the other project that the Cabinet has waved the green flag for. This is the Rs 1,20,000 Crore High Speed Rail project connecting Trivandrum with Mangalore, that the State has just approved and even pitched to the Center. Even the most optimistic estimates show the State having to pitch in with as much as Rs 2500 Crores each year (not to mention an initial investment of Rs 15,000 Crores over the first five years!) to keep this white whale running. Compare this to the Rs 3000 Crores of capital expenditure and annual subsidy of Rs 30 Crores (no, I didn't miss any zeros) needed for Vizhinjam. There are far more pragmatic solutions to the need for high speed transport, which can provide both passenger and freight transport at 1/8 the cost. Even the Japanese, who are supposed to both fund the project as well as provide their Shinkansen bullet trains to run on the tracks, have started to push for high speed freight lines over passenger services. Apparently, they understand the meaning of the words "feasibility" and "demand" much better. One 25-slide presentation, duly spiced up with pictures of Japan and Japanese bullet trains and sprinkled with fanciful numbers got the Cabinet to approve this ludicrous waste of money while the same folks scratch their heads over Vizhinjam on and on....and on. I wouldn't want to generalize but it seems that the speed with which a project is approved in the current regime seems to be inversely proportional to the feasibility of the project. Corollary: The wilder the idea, the faster it gets approved! Post Publication Note: A friend of mine had this interesting observation on the above - the more infeasible and wild the project, the more intense the lobbying and spin doctoring by vested interests who support it and stand to gain from it. This may explain why such projects tend to get pushed along in the system. Interesting thought, thanks Murali! Sadly, this bodes ill for Vizhinjam because its feasibility has been cast iron over the last 60 years and continues to grow as bigger and bigger container ships are put into service. The Government needs to jettison such ideas that the construction for the project can go ahead without an operator, who will also do the marketing for the project. The operator is needed to provide critical inputs for the project's design, to secure shipping lines to operate at the terminal, to expedite remaining approvals and to speed up the execution of additional components such as the proposed shipyard and possible energy hub at the port. Knowing the enviable track record of project execution amongst Government agencies, it would be disastrous not to have a private entity with a strong vested interest involved right from the start. Moreover, by the time the construction of Phase I is completed in 2015, a changed economic scenario could make it even more difficult to identify an operator. VISL and the Government need to call the bidder to the discussion table and impress upon them the potential of the project over and above the rather lukewarm market report. For example, CSL seems all set to become an anchor tenant with a VLCC class shipyard while there is also the strong potential for an energy import facility to bring in LNG or coal from sources along the Indian Ocean rim for a captive power plant or for onward distribution. With its strong presence in Australia and the Middle East, Leighton is well placed to tap into the energy import business while the Welspun Group already has an energy business as well as relationships with some of the world's top energy companies. Additionally, the consortium could look to bag the massive EPC contract for the port and then leverage its scale of operations at Vizhinjam to bid for some of the other major projects coming up in and around Trivandrum such as the widening of the NH 66 and the Trivandrum Monorail project. If the Government is able to lay the facts down the bidder may be persuaded to modify their bid to offer better terms. A neutral bid (no subsidy) would persuade our Sreedharan acolytes in the Secretariat that the public who didn't dare question various other shady deals will not revolt over the award of the Vizhinjam bid either! In the end, that may be the most realistic win-win we should hope for. If, the powers-that-be find some time off from listening to pitches for assorted mad projects. - Should be Rs 30 crores ? Hotel Leela chain owner Capt. Krishnan Nair of Kannur has recently complained that the Ernakulam-kottayam-Thrissur centric present UDF government are interested about projects from only Ernakulam/Kottayam/thrissur districts.. He has even gone further to demand handing over the state civil aviation portfolio to a Kannur based minister.. I think UDF government ministers along with some regional based GMBs(Gulf Malayali Businessmen)are selectively promoting the above said three central districts at the cost of Trivandrum & other parts of Kerala. MLAs and speaker from Trivandrum region happily lick the asses of their bosses from these central districts to show their loyalty in party. I feel till the day when MLAs, Speaker and MP from Trivandrum show some courage in pursuing and demanding for important projects viz. Vizhinjam, TIA etc.., it is hopeless. yes i do feel the UDF government is now looking only at the central kerala districts at the cost of other parts.Recently i saw a news that in Eranakulam government is going to pay 35 lakhs per cent for land Acquisition for metro projects.But the owners are arguing for 1 crore per cent and i think the present government will pay for it at the expense of tax payers in kerala.These are mostly GMBs(Gulf Malayali Businessmen)and NRIs.IF this was in any other part of kerala this would have been a main news. In the case of vizhinjam project the earlier government acquired land 1 years back for truck terminal,warehouse etc at comparatively low rate and these poor people doesn't got compensation the last government allotted.The reason is simple they don't have the fund.You can go through the website of vizhinjam port and kochi metro .In one you can see the compensation amount while in other you cannot see that.